It was a joyous moment when Carlos (the apartment landlord) casually remarked that, ‘ze beste chefe ine Bologna’, was simmering, stewing, baking and broiling below our very noses. It’s a dream come true really: You struggle to find the ‘right’ accommodation but when you eventually do, it is with great gratification that you discover it is the cheapest of the lot. But then of course there is the anxious anticipation of wondering what kind of den you’ve actually booked and were all the reviews written by him? We were thrilled by the apartment and the fact that ‘Ristorante anna Maria’ was located below it (not directly, so no fear of clattering pans and kitchen fans lulling us to sleep) may just as well have been reason enough for staying there. Walking into the restaurant was very much like walking into my late Grandmother-in-laws living room (albeit 10 times the size), all mid-brown highly varnished wood, an array of puzzling shelf ornaments and plastic flowers in ornate vases. This of course added to the charm and is so very different to ‘the look’ that every restaurant this side of the Channel is trying to achieve. 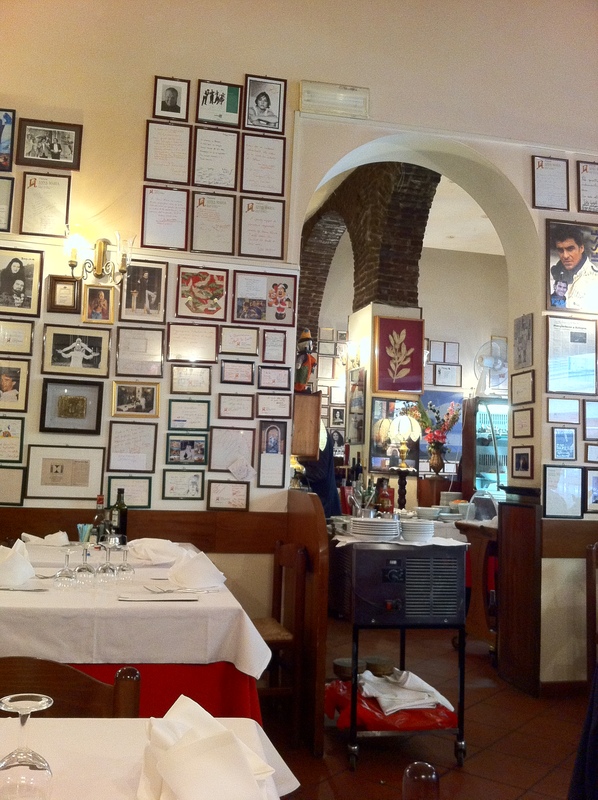 The walls were covered with ‘famous guests’, all Italian and utterly unrecognisable. I hope I’ve set the scene, but we all know it’s the pasta on the plate that matters and this was indeed wonderful. For ‘primi’, I demolished a dish of buttery, golden tortellini speckled with crunchy sage and my other half enjoyed his gnocci with sharp and creamy gorgonzola and pine nuts. The accompanying (3 Euro 1/4L!) house wine was perfectly good too. 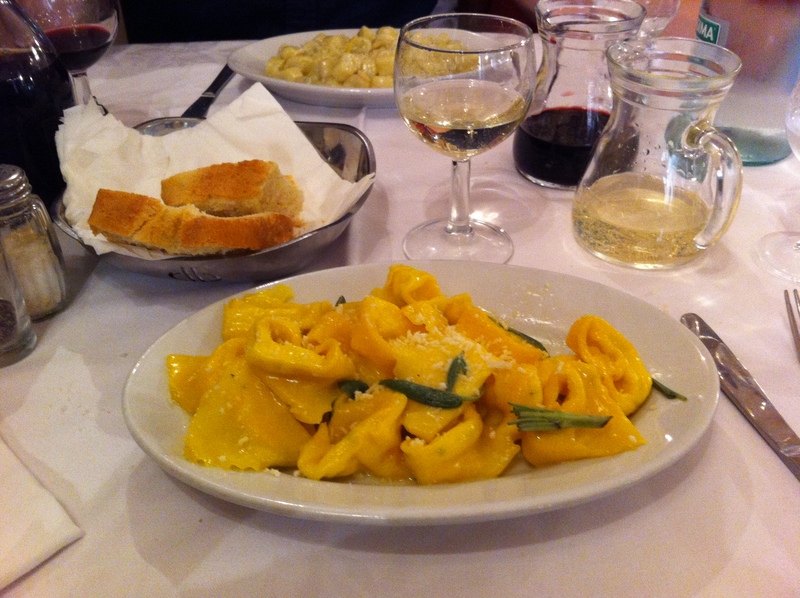 Apparently, Ristorante Anna Maria is renowned for its excellent homemade pasta and this is exactly what we got…simple and delicious, no frills, no fuss but ‘proper’ pasta. 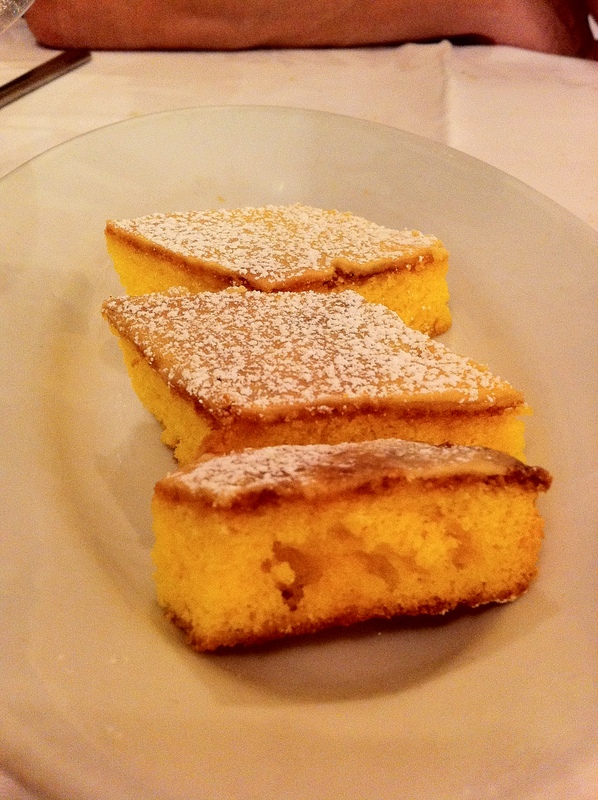 Our late arrival (2:45pm) put pay to our thoughts of ‘secondi’ and so we moved straight to ‘dolci’ with a delicious rustic polenta cake accompanied by a double espresso. The bill for lunch came to a reasonable 48 Euros including a tip. 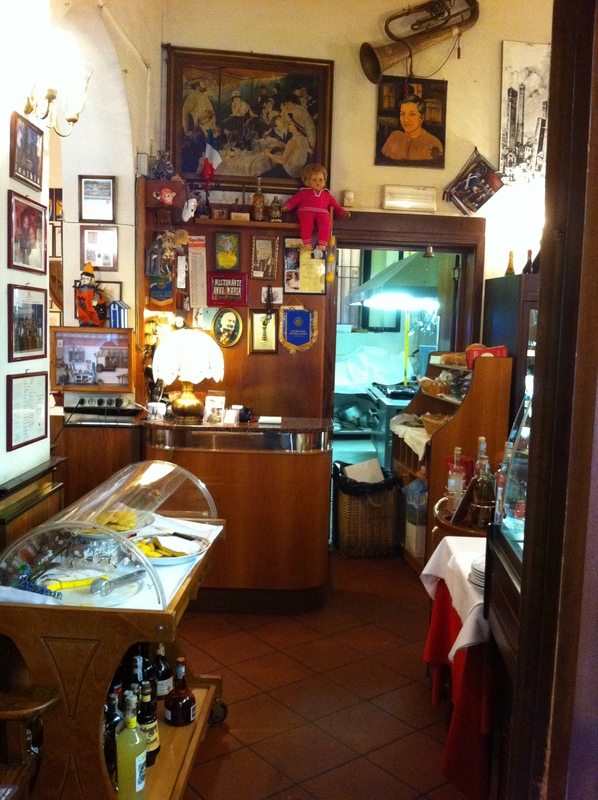 This entry was posted in Eating in Bologna. Bookmark the permalink.